When I woke up Sunday morning, I found myself staring into a box that surely signified misery, anguish, and doom. 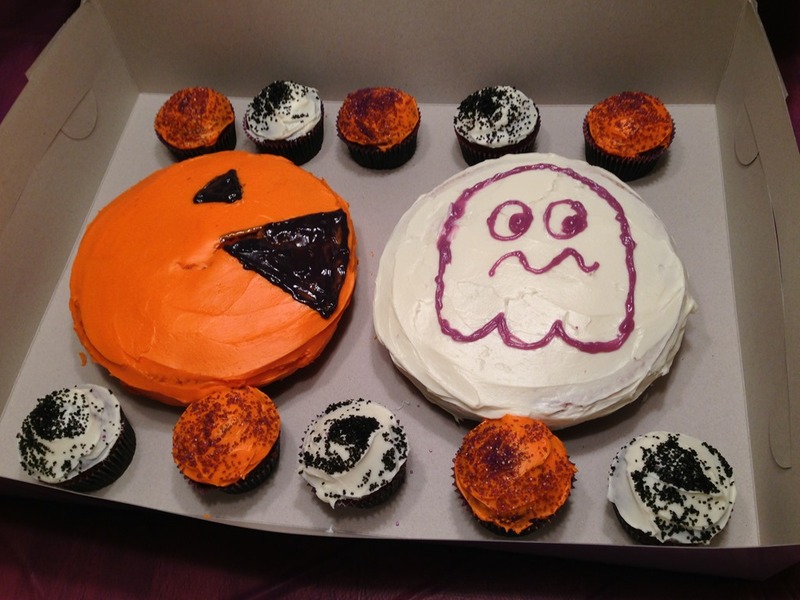 The Attitude’s 6th Birthday party was just over three hours away, and in the windowed, white bakery box that not eight hours earlier had held his finished, decorated, homemade Pac-Man/Jack o’ Lantern hybrid cake (complete with fleeing Ghost! ), I gazed down upon a spongy, crevassed ruin that represented a parent’s nightmare. Upon witnessing our loss, as I’m sure you can imagine, we spent the next half hour wailing like orphaned children while hugging our knees and rocking in place. We had failed at the most basic of Modern Parental Tests: The Themed Birthday Party with the Handcrafted Cake. In retrospect, I can’t imagine how or why we were so foolish. We should have hired armed guards to protect the cakes on pain of death for the handful of hours that we slept. And, why, in the name of the Four Fiery Dragons Of Parental Judgment, did we not think to trade a pound of butter and a soul or two (I mean, the family has six altogether…surely we could spare one) for the occult bakery blessings of Madame Pettifor, the Dark Priestess of Crafted Party Sweets. Surely for the right price she would have granted us safe passage through the dangerous night, when vengeful, mouth-less spirits apparently roam the mortal plane in search of bakery goods to demolish. But we didn’t, and instead we paid the price for our arrogance. The worst part would not even be the inevitable, unceasing shame that would burn us from pancreas to medulla as our families looked down in anger and disappointment upon our abject failure. No, the worst part would be hiding. The Lies by Omission. The inability to post pictures of the party’s icing-enriched success to Facebook and Instagram for all our followers to Heart or Like or celebrate in joyful wonder. Instead, pictures of cake would be conspicuously absent from our Sunday feeds. A void that was certain to be noticed, called out, and mocked by all the Skilled, Perfect Parents of American Social Media Society. Mighty confectionary gods, we were going to have to delete our Pinterest accounts, the modern day equivalent of racing out of town at midnight with an angry, buttercream-frenzied mobs on our heels. And only If we were lucky, could we maybe, in a few months after the event had blown over and terabytes of holiday pictures had been pinned to an endless whirlwind of Other People’s boards, might we create new users and begin rebuilding our online reputations. The anguish—the struggle—that morning was very real. Well, that is until we decided to remake the cakes before the party. And hours later, The Attitude, unfazed by any of it, enjoyed the frosting from a cupcake and then immediately began wondering when he could start opening his presents. Because he’s six. And whether or not a cake is perfect means about the same to him as whether or not tax day is coming up. In the end, he couldn’t have cared less just as long as he had a candle to blow and and got a little icing. Which brings us to today’s question: how do you ruin a six year-old’s birthday party? Duh. You can’t. At least, not as long as you try to give them something. And I’m thinking maybe there’s a lesson in there about parenting as a whole. Now then, who wants a piece of cake? I think we have some extra. Next ›It’s Election Day In The U.S. of A. We ordered a beautiful cake for our Oldest daughter’s 8th grade graduation. Her whole class was invited, it was the first real party that went late for the kids, and everyone was looking forward to it. 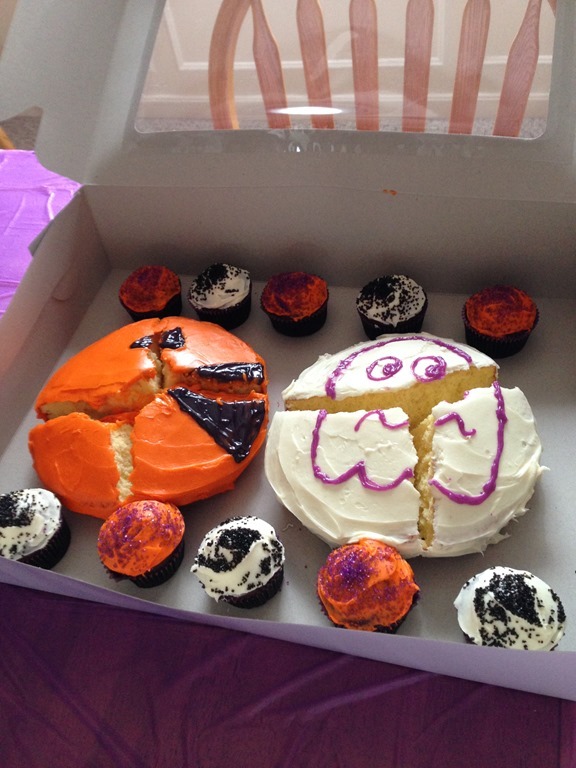 Husband went to get the cake…he tried to fix the situation, but nothing could. It was by far the ugliest cake anyone had ever seen. Everyone commented. The store bakery actually gave it to us free because it was so badly botched. The kids, well, they ate the heck out of it because it tasted good, and it was the first of Many parties Oldest One had in high school. The only thing that can really ruin a party is when they are old enough so you have to patrol and pull apart those trying to hide by the pool equipment to make out. And then it’s only ruined for those two, because everyone else laughs at them. Bahaha!!! Mornings ARE a terrible time for everyone, that’s why i religiously sleep through them. 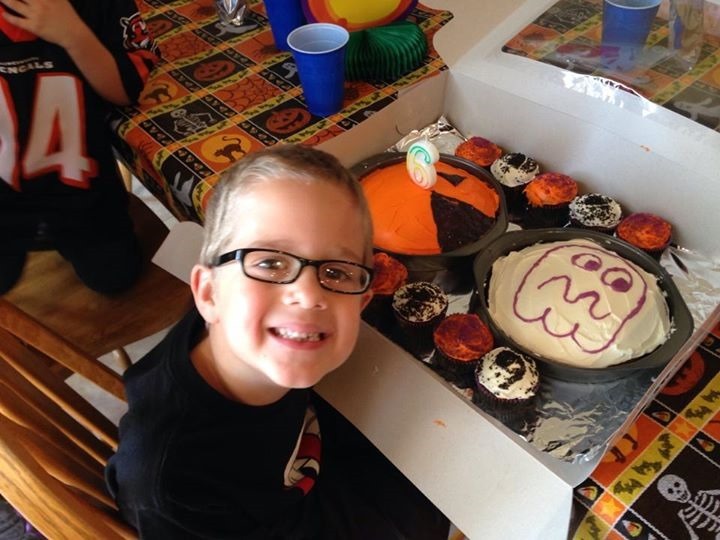 I think the whole thing is a riot; ESPECIALLY because this particular six year old was not at all fazed by the situation — I also think Pa should probably been called before the cracked cakes were disposed of so they could be properly documented in our Gallery of All Birthday Cakes!!!! LOL, LOL!